Regardless of the content, a tool is required for creating slides and doing presentations. For quite some time I’ve been on a quest to find a tool that fits all my needs. As many I’ve started with Microsoft PowerPoint which is a very easy tool to create standard (and therefore boring) slides. 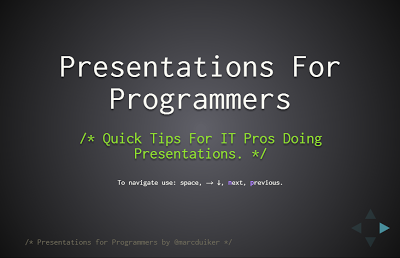 I actually find it difficult to create interesting and captivating presentations with PowerPoint and that’s why I don’t use it. Next I tried Prezi for a while. Initially I was really blown away by this platform with its possibilities to zoom, translate, rotate etc. I still very much like these effects (when used in moderation) but I had some issues with applying custom styles and using the Prezi offline. The major downside for me is the lack of offline editing in all but the most expensive licenses. Another nuisance is the size of the presentations when used offline, these are huge compared to other platforms. And now there is HTML5. And I love it. 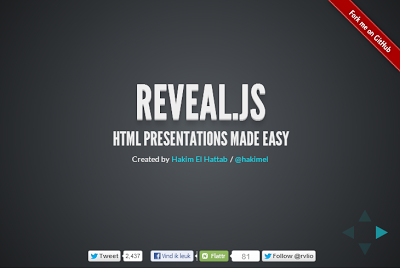 A lot of HTML5 presentation frameworks are emerging and currently I’m experimenting with reveal.js (written by Hakim El Hattab). Really have a go at this one if you haven’t seen it yet! I used Sublime Text 2 to create the html (based on Hakim’s template) and a custom css theme (I named it programmer.css). I used a monospaced webfont called Inconsolata in order to get an IDE look and feel. The color scheme is based on the Monokai theme. Feel free to re-use or adapt the programmer.css theme in your own reveal.js presentations.